Rower is an excellent exercise for improving your cardiovascular endurance. It will also build your legs, shoulders, lat muscles and strengthen your hips and lower back. 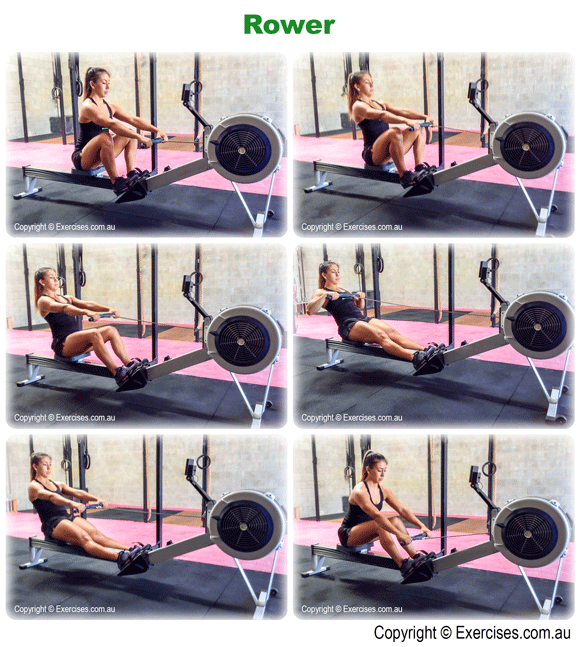 Rower is a great way to build conditioning as it engages both the upper and lower body. If you want to burn fat and lose weight, use Rower as part of your High Intensity Interval Training or HIIT program. The first thing you need to do when you sit on a rowing machine is to secure the foot straps. It should be secured near the end of your shoe laces. This allows your feet to remain stable and your heel to elevate during the exercise. Set your body position in the rowing machine. Keep your knees bent at a 90 degree angle. Your knees should be tracking over your feet. The seat of the rowing machine must be as close to the heels as possible. Grab the handles of the rowing machine. Keep your hands near the end of the handles; you can keep your pinkies outside. The wider the grip the more engaged the lat muscles. Your arms should be kept straight and positioned outside your thighs. Shoulders should be set slightly ahead of your hips. Initiate the row by taking an upright position; your shoulders should now be in line with your hips. Lean back then push out with your legs by extending at the knees. When your shoulders are past your hips, pull the handle until it touches your chest or sternum. From there, straighten your arms out and allow the resistance to pull you forward. Bend the knees and bring your legs forward; your shoulders should go past hip level to set the body up for the next repetition. A common fault in Rower is to start the exercise with legs partially straightened out then pulling the handle by leaning back. This places a lot of pressure on the lower back. Another common fault is trying to use arm strength to initiate the row. You will not last long as your arms will give out easily.